A set of hot music by Ed Polcer, cornet; Duke Heitger, trumpet; Russ Phillips, trombone; Allan Vache, clarinet; Matt Munisteri, guitar; John Cocuzzi, piano, Frank Tate, string bass; Chuck Redd, drums. Recorded April 21, 2012 at the Atlanta Jazz Party. Ageless music — even if the repertoire comes from 1917-1935, the energy, wit, and passion are unabated. Let’s see. How many jazz musicians / singers do you know who have performed and recorded with Norah Jones, Kevin Dorn’s Traditional Jazz Collective (and the Big 72), the Grove Street Stompers, Blue’s Clues, J.C. Hopkins, Willie Martinez, the Pre-War Ponies, and more? Let’s complicate matters. Make this imaginary personage a singer, trombonist, ukulele virtuoso, composer . . . give up? Why, it’s Mississippi-born J. Walter Hawkes, someone who raises the spirits of the band and the audience by just walking into the club. I first heard JWH at the Cajun in late 2004 and have delighted in his playing and singing since then. And then he picked up his trombone, once again melding the two Greens, Bennie and Big, playing with force and delicacy, bringing hip harmonies into a traditional ensemble. I’d never had the good luck to hear him show off his ukulele talents on a gig (although I’d seen him do this on YouTube) but JWH is now out in the open for all of us who haven’t yet had the pleasure — he’s recorded and released his first CD as a leader, something we’ve been waiting for. It comes in a brown wrapper — a recycled cardboard sleeve — but there’s nothing low-budget or ordinary about the music within. 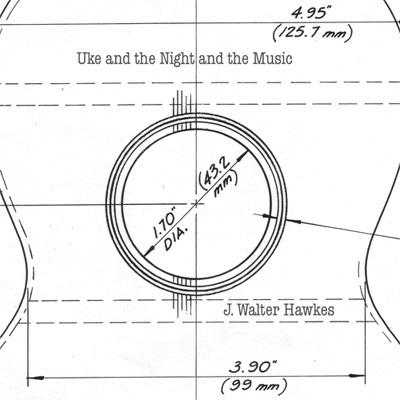 And, yes, it is an indication of JWH’s sense of humor that it’s called UKE AND THE NIGHT AND THE MUSIC. The songs are COQUETTE / IF I LOVE AGAIN (taken at a rocking tempo) / UNDERNEATH A BROOKLYN MOON (a pretty original by J.C. Hopkins) / YOU AND THE NIGHT AND THE MUSIC / SAY IT SIMPLE / BUY ME A BEER, MR. SHANE (not too difficult to unravel) / SUNDAY SUIT (THE GAY 90’s) / WHAT CAN I SAY, DEAR (AFTER I SAY I’M SORRY) / CRYIN’ FOR THE CAROLINES. JWH plays trombone, ukulele, and sings; the fine bassist Doug Largent adds his melodic self (and “Vectrex Dreams,” whatever it or they might be), and Andy Burns is heard on drums and vocals. “Skullduggery,” too. It’s a wonderfully rewarding disc — varied, heartfelt, comic, and tender. You can buy it direct from JWH on a gig (the best way, I think) for $12 or a cassette for $7. Or to purchase the CD from his site, visit http://www.blatomaster.com/music.php.